Are you looking for a place to go in Orlando? Well look no further and set your sights on Fun Spot. This fun attraction spot is located at 5551 Del Verde Way, Orlando, Florida 32819. It is just off International Drive, near Kirkman at the giant Ferris Wheel, near Universal Studios I-4 exit 75A. The park is open Monday through Sunday from 10a.m. to 12a.m. and offers Go-Kart tracks, bumper cars and boats, arcade games, rides, and more. What more could one person ask for? If you love Go-Karts, race your way over because this mini-amusement park is full with them. One can have the option of getting a Go-Kart armband that is about 35 dollars and it entitles you to ride the Go-Karts an unlimited amount of times with unlimited video games. They offer a similar package for 25 dollars for the kiddos. There are other armbands available such as the Track Sampler band its only 20 dollars and you get to try each of the go-kart tracks this should suffice if you are a Go-Kart junky. Overall, they have some great deals for the people who love Go-Karts. Ride the latest in electric bumper cars at Fun Spot! Circular cars let you bounce and bump other riders from every direction. It’s great family fun for kids of all ages. They are bumper boat style cars, without the water. However, say you wanted to get a splash or two; Fun Spot has bumper boats too. You can motor around with your friends and family while bumping and splashing under a fountain of water. Both allow you to race around like the Go-Karts, but this time you can crash into people, wet or dry. So if you like, to crash these are the perfect attractions for you. If one wants to beat the heat, one can do so by entering the Winners Circle Arcade Room. It is 10,000 square feet of air-conditioned fun for everyone. There’s also a second story of arcade games. Test your skills on every video and redemption prize game imaginable. Most of these games you can win tickets for prizes. There are plenty of games await for you just to name a few there are Big Bass Fishing, Barber Cut, and Wheel of Fortune games. You can also purchase an unlimited pass to play the games on the second story, which is an unbelievable deal. So come on in and test your skills! Lastly, Fun Spot offers thrill rides, such as, the paratrooper, the scrambler, the revolver, and a fun slide. The paratrooper helps with the heat spinning you around and around, while the wind blows through your hair. If you don’t want to just spin in circles, how about backwards, inwards, and outwards? The scrambler will do just that confusing you to which way you spun last. The revolver is a 100-foot high Ferris wheel. 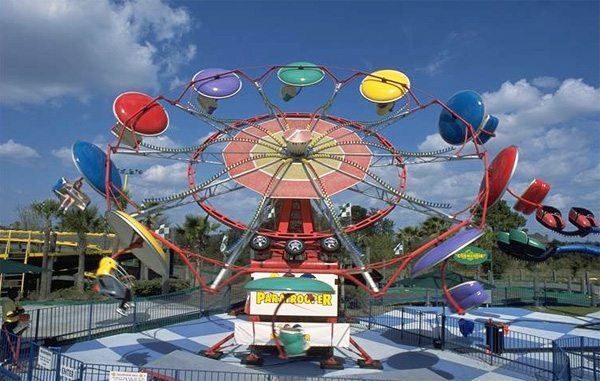 One will have a magnificent view of I-Drive, Universal and Orlando in this fun and colorful wheel. This will give you time to relaxing and figuring out what to do next at Fun Spot. There are all kinds of adventures to be had at Fun Spot in Orlando so next time you are looking for a “fun spot” stop in, you won’t regret it. Named the “Best Budget Attraction” by the Orlando Sentinel for the last 5 years. Home of THE DUI EXPERIENCE; a free educational event for school, civic and church groups to experience driving under the influence without ever drinking. Purchase your Orlando attraction tickets at discount prices.